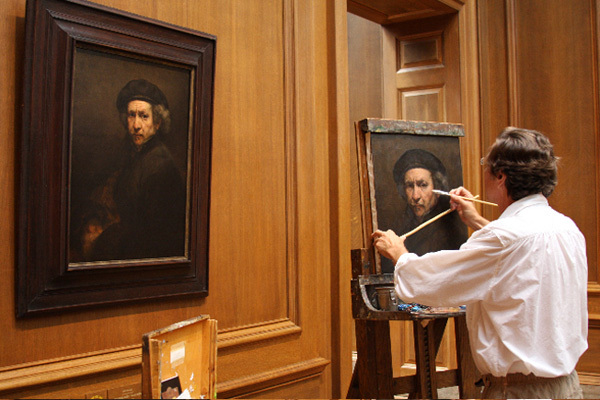 In 2008, I went to D.C. where I spent two weeks copying at the National Gallery of Art. Truly a dream come true. The last time I copied was at the Metropolitan Museum of National Art in New York City some 25 years ago when I was an art student. It made such an impression on me then and I always encourage my students to try and make the opportunity happen for themselves. Well, I took my own advice and made it happen! What an experience – to be surrounded by masterpieces all day long. I literally had to pinch myself. And to top it off, I received permission to copy Rembrandt – my hero!! A self-portrait painted in 1659 at the age of 53. During this period, he declared bankruptcy and lost everything. Ten years later he dies. Of course, I wanted to study his technique. Being in the presence of his work, it speaks to you. When that happens the world stops and you’re transformed to another place. I often wept while painting being in the presence of such great strength and wisdom, vision and sensitivity to life. People came in hordes to see the greatness of Rembrandt, and they were in awe as I was. Of course many people had endless questions about what I was doing and why I was there. I at times, felt like a representative of our country as so many of the people were from all over the word. This experience has had a profound affect on me. I feel so lucky to have the painting in my studio as a wonderful memory and inspiration.